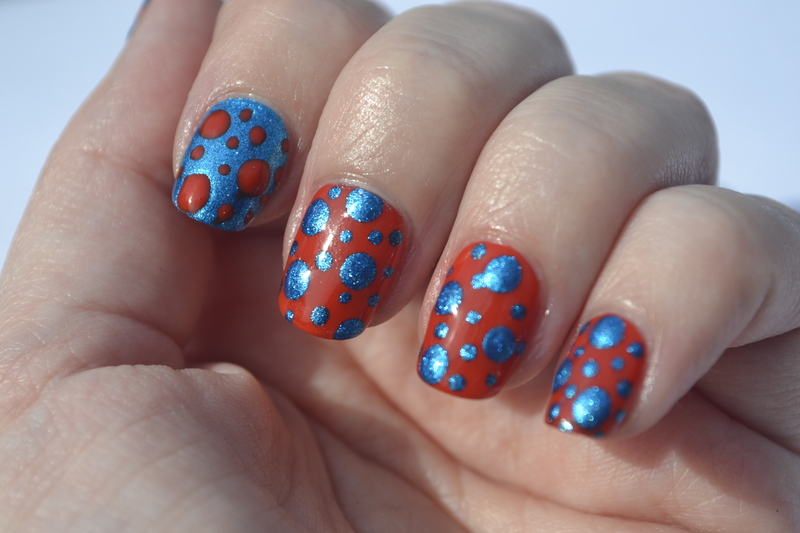 June 28, 2014 / Rachel C.
This week, the SIMPLES lesson and assignment was based on mixed sized dots. This is normally something I would really enjoy doing, but for some reason today was just not my day. 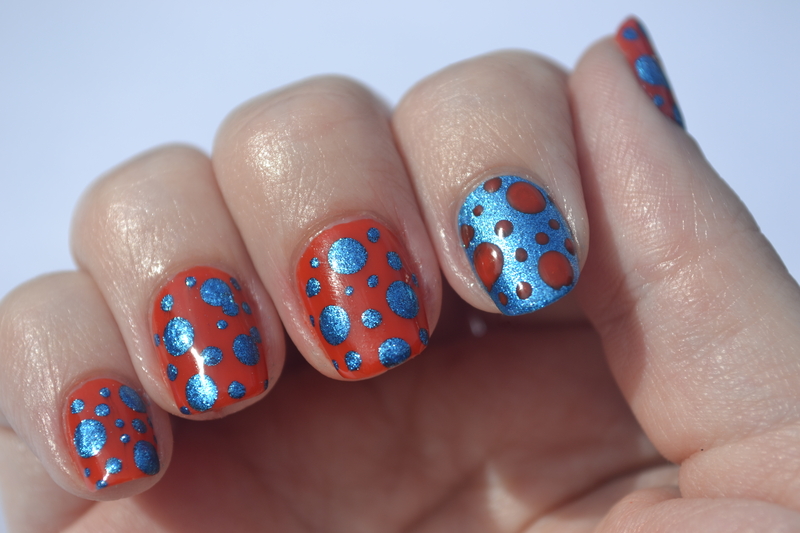 I chose to use Kleancolor Metallic Aqua and Essie Meet Me at Sunset, and I think it was the latter color choice that led to a few of my dots being not quite right (although the Kleancolor ones weren’t perfect either). My ‘random’ pattern also at second glance doesn’t appear to be as random as I would have liked, and I just plain do not have enough dots. The only thing I like about this mani is the color combination. 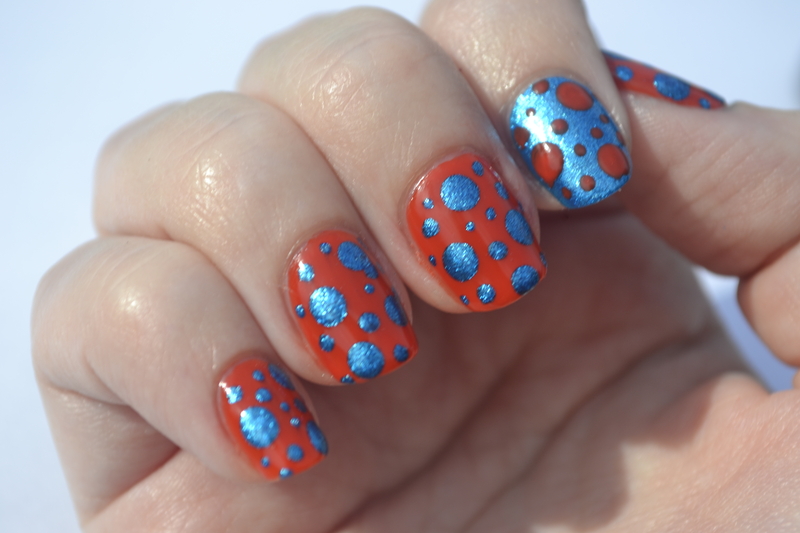 I promised myself in a past post that I’d revisit the orange and teal/blue combo, and I actually followed through. So ‘yay’ for that! This is also one of those rare occasions where I think that my right hand turned out better than my left. Despite a mishap or two, I feel that there is something about the right hand that I like more. Just a personal preference, I guess. And bonus, this hand didn’t really smear like the left did while I was applying my top coat! Eh, I guess looking at it again, it’s not so bad. Not my favorite mani ever, but not my worst. 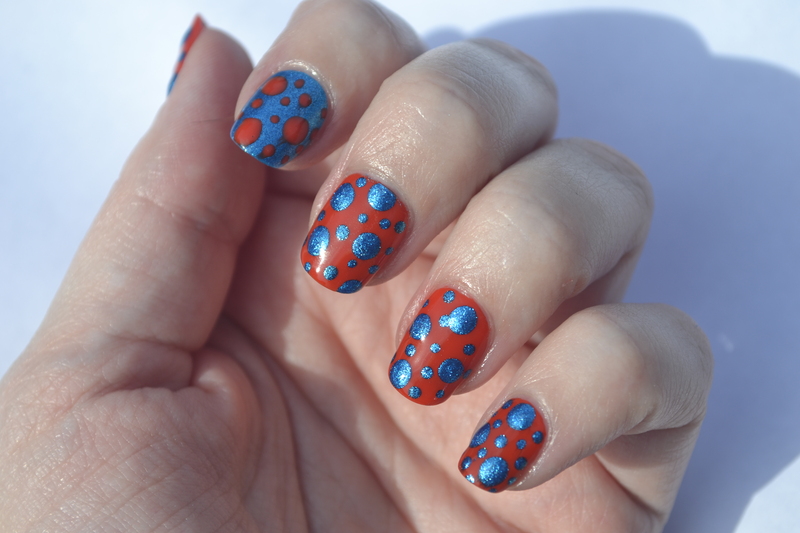 And I learned how NOT to do a mani with random mixed sized dots, so next time should be better! I’d also like to share a bit of exciting (for me) news. I got a feature on the Nail Art Gallery! They do features on nail artists (both professional and not) fairly often, and I was really happy that I was asked to submit a few images. Thank you, I really appreciate it!